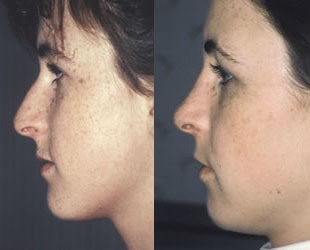 Rhinoplasty means to change form, shape or function of the nose. It is also referred to as a nose job and is performed for purely cosmetic reasons. It is a surgical procedure that is performed to bring the nose to a more harmonious balance with the rest of the face. A septoplasty is performed to improve a person’s functional breathing from the inside of the nose and to improve the airflow dynamics through the nose. A turbinate reduction surgery on the inferior turbinates is also performed internally for breathing. A turbinectomy also improves the airflow through the nose. A Rhinoplasty can be performed together with internal functional breathing procedures. In addition, a broken nose can also be repaired if needed at the same time as a rhinoplasty or septoplasty. Nasal surgery is one of the more complex of all cosmetic procedures because the nose is a 3-dimensional structure that includes bone, cartilage and skin. These components must look symmetrical in a 3-dimensional fashion as well as allow for proper breathing. Making changes in one of these components can affect other elements within the structure of the nose, changing functionality as well as appearance. Following a rhinoplasty surgery, the patient’s nose should look very natural and be in balance with the remainder of the face. Your rhinoplasty surgeon will determine which is the better technique for them to use with each different nose. Both techniques offer excellent exposure to allow the surgeon to perform the rhinoplasty. The closed technique makes 2-4 incisions inside the nostrils, the skin is then lifted off of the cartilage and bone, the surgery is performed and the skin put back down. The open technique involves making the incisions on the inside as well as an incision across the columella (outside) and peeling the tip skin upwards to gain exposure. The skin is then lifted off of the cartilage and bone, surgery is performed and the skin put back down. The incision across the columella is then sewn up. The advantage to the closed technique is there is no external incision and faster healing time. 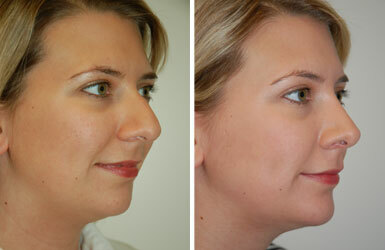 The advantage of the open rhinoplasty is to gain more exposure which is sometimes required in revision rhinoplasty. The disadvantage to the open technique is that the incision will be visible for several months, there is more scar tissue and prolonged swelling and edema of the tip. This is a tradeoff when performing difficult revision rhinoplasty such as when cartilage grafts are placed. 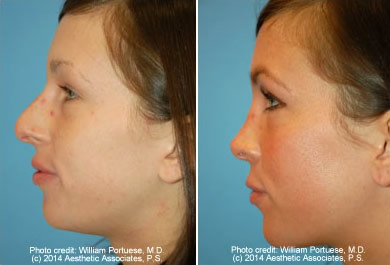 Dr. Portuese has performed thousands of rhinoplasty surgeries and can perform both open and closed techniques. He prefers to perform most routine primary rhinoplasty thru the closed technique while most revision rhinoplasty can be done either closed or open technique. When looking to perform a rhinoplasty, realistic expectations from the patient’s perspective are very important. The goal of rhinoplasty is to reshape and sculpt a new nose that fits harmoniously with the face and fits into the facial balance for each individual patient. Every nose job is different. There is no one perfect nose. The earliest age at which a Rhinoplasty should be performed is usually age 15 for girls and about 17 for boys. The nasal bone growth plates have not finished growing until that point and cosmetic surgery should be withheld until the face is fully developed. The septum of the nose continues to affect the growth of the middle portion of the face and maxilla. Any changes to the septum either surgical or through injury, before it reaches maturation, can affect further facial development.